Forgive the boxing reference, but indeed, it was a big win for Magnus Carlsen in Round 10 of the World Chess Championship 2016 to even the score, with 5 points each, against the Challenger Sergey Karjakin of Russia. With 5 points apiece and two more rounds to go, this match winds down to a best of two games. 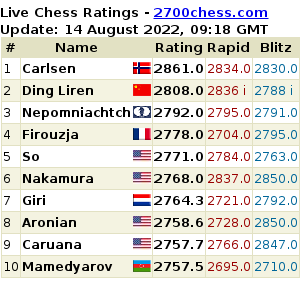 Round 11 is on and live coverage should be available in ChessHive Live page. Remember that you may enjoy multi-camera live streaming with live commentaries by chess celebrities and grandmasters if you unlock Worldchess.com’s full service when you visit their official website. Furthermore, you may enjoy 10% discount if you use our promo code: BISHOPD3. Replay all the games in the World Championship 2016. As its said in basketball,we have a game!